Del Webb at Lake Oconee sits on 1,400 feet of direct lake access with a boat launch and boat slips. Set on the shores of a navigable lake, Del Webb at Lake Oconee is the perfect retreat for water lovers. This beautiful community has a rural setting in Greensboro, Georgia, yet its exciting line-up of indoor and outdoor amenities offers a full social calendar for active adults aged 55 or better. Del Webb at Lake Oconee is also just 75 miles east of Atlanta, making it easy for residents to enjoy nearby shopping, dining and cultural attractions. Opened in 2007, Del Webb at Lake Oconee features natural scenery with rolling hills, towering trees and the glistening water of Georgia's second largest lake. The man-made Lake Oconee offers 400 miles of curving shoreline and 19,000 acres of navigable water. It's the perfect place for boating, sailing, kayaking, water skiing, swimming and fishing. Despite its recreational appeal, Lake Oconee is usually one of the least crowded lakes in the region. Residents of Del Webb at Lake Oconee enjoy 1,400 feet of direct lake access, along with a boat launch, 38 boat slips and a boat storage facility. 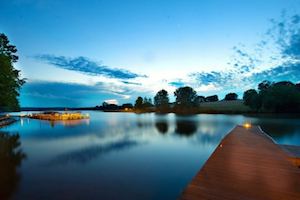 While Lake Oconee is an appealing draw, the community provides a number of diverse amenities. These recreations are largely centered at The Club at Lake Oconee, a 21,000 square-foot clubhouse. This welcoming facility brings residents together with lounge areas, hobby and game rooms, a spacious ballroom and a cozy library. A state-of-the-art fitness center offers the latest cardiovascular and strength-training equipment. 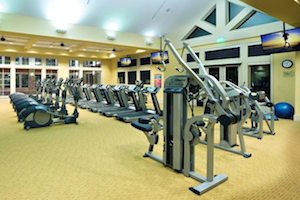 The Club at Lake Oconee's state-of-the-art fitness center provides cardiovascular and strength-training equipment, as well as an aerobics and dance studio, and an indoor lap pool. The arts and crafts studio lets residents explore creative pursuits, while cards and billiards rooms offer friendly competition. Outdoor recreations make it easy for residents to enjoy the beauty of Northern Georgia. They can gather on the clubhouse's outdoor patio, swim in the resort-style pool or make use of the varied sports courts. The grounds feature four tennis courts, two pickleball courts, four bocce ball courts, two horseshoe pits, a softball field and a croquet field. There are also gardening plots, a pet park, a lakeside pavilion, eight miles of walking trails, R.V. Parking and a playground for visiting grandkids. Home construction in Del Webb at Lake Oconee is still underway with plans for a total of 866 homes. Interested homebuyers can currently choose from available resale and new construction homes in both attached duplex and single-family designs. Homes range in size from 1,217 to 2,722 square feet, and have a minimum of two bedrooms, two full bathrooms and a two-car garage. For active adults in Northern Georgia, Del Webb at Lake Oconee offers the tranquil charm of a rural community along with the appealing amenities of resort-style living.